In his 1945 book Teacher in America, cultural historian Jacques Barzun wrote, “Teaching is not a lost art, but the regard for it is a lost tradition.” Oh, what the now-centenarian Barzun must think today as he, like many, witness a decline of educational institutions that mirrors the erosion of societal and cultural mores. In a world that has never seemed more interconnected or replete with ready sources of information, our system for transmitting that knowledge to our young people has never felt more broken. At the center of this morass lies the teacher, asked to ably wear many hats: educator, counselor, disciplinarian, friend, and role model. All these facets and more are on visceral display in director Laurent Cantet’s The Class (Entres les murs), the first French film in 21 years to receive the Palme d’Or at the Cannes Film Festival. Set squarely inside the walls of a racially mixed, inner city Parisian middle school, the film lays bare the increasingly uneasy relationship between teacher and student as an extended power struggle for classroom supremacy. It is a relationship based not on a need for mutual respect, but more the desire to forcibly extract that respect. 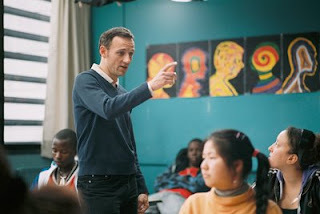 The Class is adapted from a semi-autobiographical novel by real-life teacher François Bégaudeau, who also stars in the film as a literature teacher François Marin. Set squarely during a single, nine-month school year, François spends the bulk of his days coping with his students’ unruly behavior while also trying to educate and, hopefully, inspire. Their byplay is akin to a daily joust, with François trying to coax his students into a state of learning while they test his authority in hopes that he will succumb. François’ brash, even egotistical persona always seems just one slip-of-the-tongue away from stepping over the line. And, indeed, an invective François eventually hurls out of frustration at two female students finally casts the class into a state of near-anarchy. Cantet employs a raw, quasi-documentary filmmaking style to frame often unscripted dialogue delivered by a cast of ordinary French teenagers playing students like themselves. The result assigns blame on both sides for their sorry situation. The behavior of many students is deplorable. But, even some high-minded educators spend breaks in the teacher’s lounge venting about their unruly pupils – “animals” one calls them in a fit of rage – or conjuring a point-system to quantify, and thereby judge, each student’s conduct. More time is dedicated to discussing how to cope with the students than how to reach them, despite the fact that many of them repeatedly exhibit talent and a latent yearning to learn. That the school’s concrete playground resembles a prison yard is no coincidence; the significance behind that similarity, however, remains the providence of the viewer. All that said, this Class is not in one by itself. Foremost among the film’s deficiencies is that the role – and fault – of parents is sanitized. Scenes involving parent-teacher conferences add flavor, but the parents, even those of the most undisciplined youngsters, are depicted as caring and dutiful. To American viewers, this portrayal is not only grossly unrealistic, but it also casts the students’ misbehavior into a mysterious vacuum. The only tangible explanation Cantet provides is the class’ multiethnic makeup of whites, Asians, Arabs, Afro-Caribbeans, and Africans who are themselves at odds along nationalistic lines. In this respect, The Class is a bit like Michael Haneke’s Caché, whose indigenous racial subtexts carried more resonance with French audiences. Subplots come and go without explication, such as one involving a Chinese student whose mother is arrested and faced with deportation. The resolution to François’ in-class insult is far too tidy. And, when a particularly unruly girl reveals that she spent her free time reading Plato’s The Republic during the school year, it feels like she’s auditioning for membership in Dead Poets Society. Indeed, the question that lingered throughout The Class was that if it were stripped of its Gallic setting—and the associations we have with such schoolhouse-set classics as The 400 Blows or Zero de conduite – would there be an ounce of difference between it and such pedagogical pap as Freedom Writers or Mr. Holland’s Opus? Yes, because unlike those Hollywood cookie-cutters, this is a film without saints: No ex-Marine to stir their dangerous minds; no poetry-spouting professor urging his class to seize the day; no violinist tapping into their music of the heart. There is honesty and the sad reality of an imperfect system populated by flawed, if well-meaning people. When a young girl named Henriette approaches François and declares she did not learn anything in class the entire school year, she further confesses, “I don’t understand what we do…in everything.” The same frustration could be expressed about much of The Class. Yet, while the film is short on answers, the questions it sublimely raises are all too real.